I fancy that I'm the first person to do this. Replacement monitor so no inverter needed (I wonder if a firmware could enable inverted video for real Nintendo ones). I finished the padhacks today. Kept the wiring original by building a unisystem compatible fingerboard. Now what to do with the select buttons? The standard seemed to be expecting this with empty pins right next to the starts, so I'm halfway there. And no, I'm not the person that ruined the CP with those joysticks. But they work well. I have a weird issue with one of my many Front Loader NESRGB mods. Did you install the extra voltage regulator that comes with the NESRGB kit? I recall the Everdrive uses quite a bit of power, and the NESRGB takes its share as well, so if both are on the original regulator, it might not be able to supply enough current. Also, are you using the original power supply? If you are using a 3rd party it might not be powerful enough. I can't remember the specifications now, but a 1A one would surely be sufficient, probably a slightly lower one as well. signal on my dlp tv, and gave a fuzzy picture on a crt. I used one of my original adapters instead of the 3rd party one the person sent with the system, and it magically started working on both tvs. In fact just to make sure that whoever buys a nesrgb system doesnt use one i always include an original supply with it. the second voltage regulator isnt nessecary if you replace the original one with a 1.5a 7805CV regulator. when i did this to my first nes i left it on for a few days straight with the nesrgb and everdrive. the regulator only ever got warm like normal and nothing bad happened. 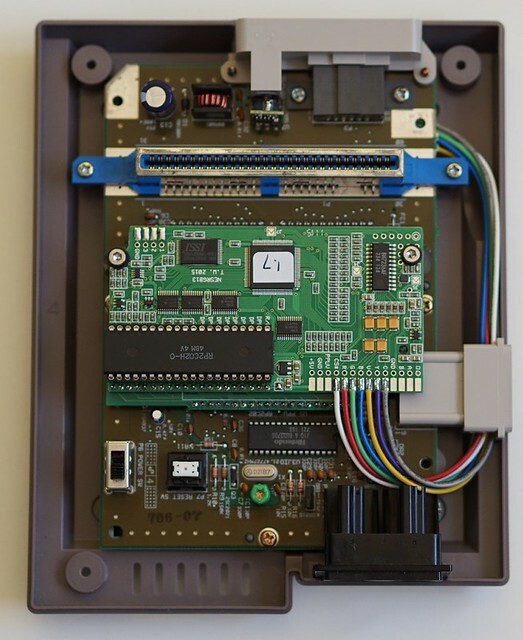 btw, Antron that vs is cool, I was kinda hoping someone would do one install of a nesrgb into a playchoice board though so they could keep the menus. and i have yet to see Gametechs Nesrgb Nestv. that would be neat to see too. Last edited by mvsfan on Wed May 20, 2015 11:31 pm, edited 1 time in total. Nice! Get yourself a powerpak or everdrive and throw these on it, it'll be like playing on actual unisystem hardware as well! Anybody know where I can get a hold of one of those 3d printed rear panels for the US toploader now that assemblergames is offline? I fancy that I'm the first person to do this. I think you are, despite all the talk about it early on. I could invert the video in software. The Nintendo monitor probably wants a large swing video signal so a separate video amplifier would also be required. Changing the regulator from the 1A to 1.5A version has no effect at all on the power (heat) dissipated by it. That is dependant on the load and input voltage. The only time it would source > 1A is under a fault condition, anyway. Though the screw-holes aren't really optimal for panel mounting. Last edited by darcagn on Mon May 25, 2015 1:34 am, edited 1 time in total. Thanks for the replies guys, I`ll try reaching Helder by his E-mail. I'm thinking of wiring the Player 1 select to the player 2 start button. Can anyone think of any 2 player games that use player 2 start or select? Pausing is probably not an issue because player 1 could do it. What about starting a 2 player game, everything I can think of uses p1 select, like SMB. Battletoads use P2 start to begin a two player game. Thanks, I knew there would be some but I'd hoped it wouldn't be one as good as that. I've gone ahead and done it anyway for the time being. Recently I've modded Ghegs' Famicom AV, so here's my take on the installation. I used 22AWG wires, replaced the 7805 regulator with an OKI-78SR-5 Switching Regulator (had to remove the heatsink from the MB) and additionally glued two threaded standoffs to the Famicom's MB to secure the NESRGB PCB. It's not in the pics, but instead of the regular switch to change the palette, I went the switchless way and installed a micro-controlled with Rikard Bengtsson's awesome program. 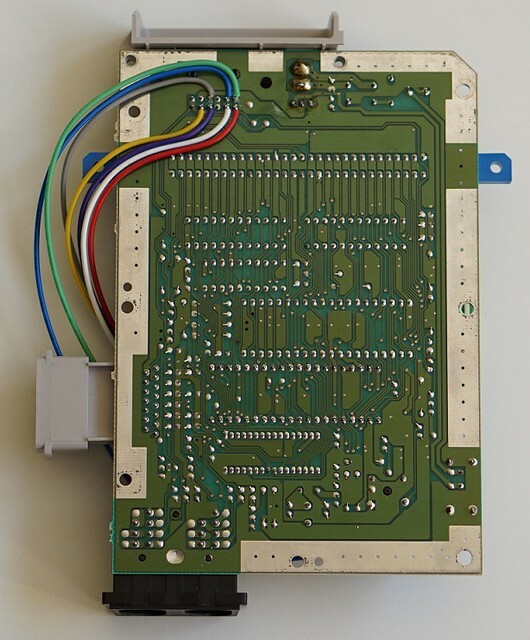 The NESRGB PCB is so well thought-out, I really enjoyed working on this mod. 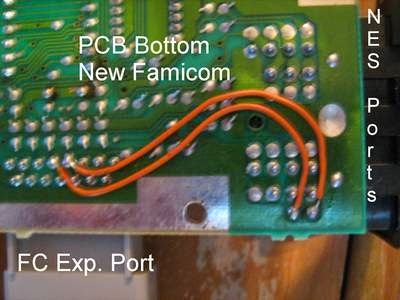 Btw, I forgot to mention this earlier but the PAL top loader should *not* use any adapter PCB. I went off assumption and soldered the AV Fami / US Top loader adapter board onto the NESRGB and my dad had to come to the rescue to desolder the damn thing because with the adapter board, the NESRGB touches the cartridge slot and the top cover won't fit on. Just installing the NESRGB as-is, everything fits fine. I had a report about this earlier in the year. I'll put a note in the installation guide about it. I think the PAL top loader NES may have only been released in Australia. 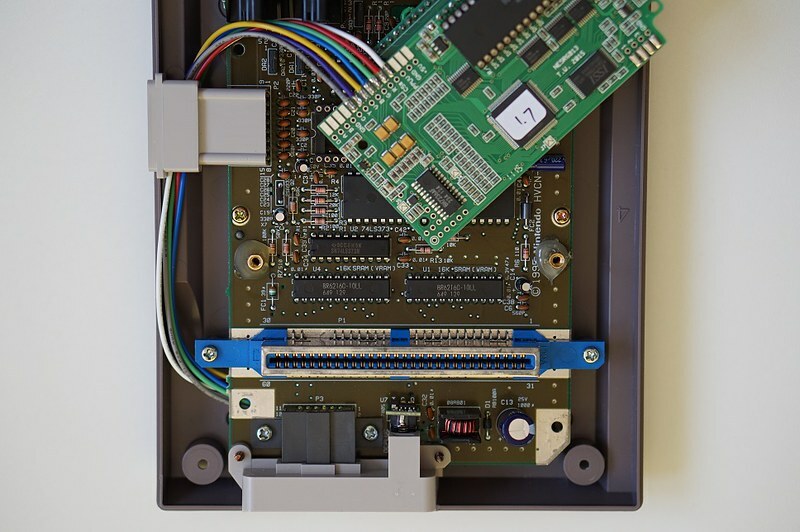 There are also 2 versions of the us top loader that were revised motherboards that were only available if someone complained to nintendo about poor video quality and sent their toploader back in to service. One of them was an RF model wich has the cpu and ppu shifted to opposite sides of the motherboard. I have experience with this one and it also should NOT use an adapter board. everything will work fine without one. The other revision came with an A/V famicom style multiout. This one is very rare and i have never run across one. If someone does they would probably be better off to sell it as original and not mod it. It has only been released in Australia, I imported mine. ... It's not in the pics, but instead of the regular switch to change the palette, I went the switchless way and installed a micro-controlled with Rikard Bengtsson's awesome program. Thank you! Nice to hear that it came to use outside my own projects. I have a tototek famicom to psx pad converter which I use to play games with my psx arcade stick. My only complain is that I can't play them with my friends usind two sticks, as there is only one expansion port. But looking at the picutre of your mod I wonder if two pad converts would work simultaneously if i swap their plugs with mini dins... I should check it! you could put db15 connectors on there instead of the nes ones. are you still offering mod services to install the NESRGB board? And if others offer this, I'm interested in checking your prices! 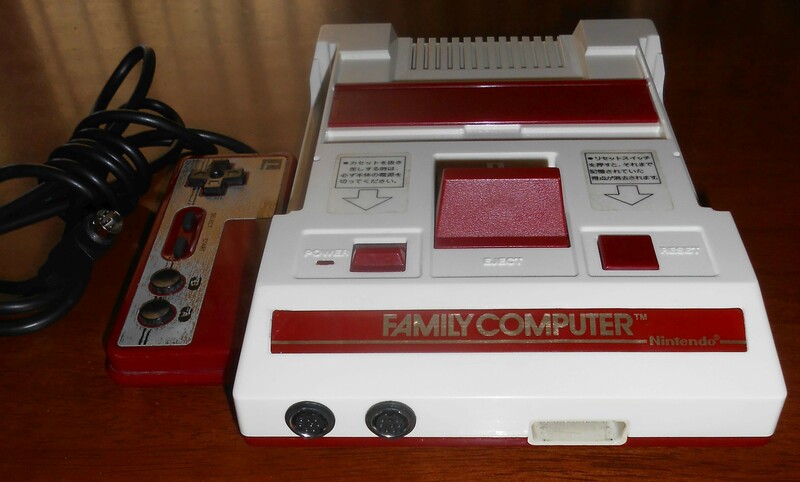 Did any of you guys have to tweak your disk drive after installing in a Twin Famicom? Mine just decided to stop reading disks (red light on forever). It worked on the bench post NESRGB installation. Hooked it up to main display, got a game to load, start button sent it to a loading screen that never ended. Powering down and trying again won't load the game. I don't think it is related to the NESRGB install, but I just wanted to note the coincidence. Perhaps it finally threw the belt. I didn't have to on mine. It's a fresh-ish belt. I expect it's because of turning the system over to unscrewing and screwing the case screws might have shifted something out of place.